As the sustainable fashion industry takes off, there are many influencers who continue to inform, impact and ignite the movement for greener apparel initiatives. 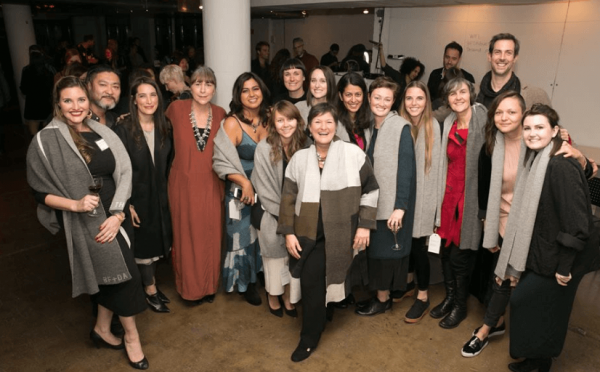 At the BF+DA Positive Impact Awards held Friday, Nov. 4, at the Brooklyn Fashion and Design Accelerator, the greater design community came together to pay tribute to those who advocate for more environmentally-friendly production, sourcing and style. The awards ceremony acknowledged individuals who furthered sustainability on all levels, including Patagonia director of environmental strategy Jill Dumain, Sustainable Apparel Coalition chief executive Jason Kibbey, Canopy founder and executive director Nicole Rycroft, Bolt Threads vice president of product development Jamie Bainbridge, Sourcing Journal senior editor Lyndsay McGregor, Green Eileen director Cynthia Power, designers Teslin Doud, Carmen Gama and Lucy Jones, Kordal Knitwear founder Mandy Kordal and Pratt Institute adjunct associate interior design professor Tetsu Ohara. Recipients were hand-picked by a selection committee, which included Ecouterre managing editor Jasmin Malik Chua, designer Amy Congdon, Eileen Fisher, NRDC senior scientist Linda Greer, CFDA director of education and professional development Sara Kozlowski, Loomia founder and creative technologist Maddy Maxey and Cradle to Cradle president Lewis Perkins. In addition to the awards ceremony, BF+DA also celebrated its second birthday. The accelerator’s social innovation Venture Fellows, including vintage apparel darling American Deadstock and sustainable menswear line Fanmail, opened their studios to attendees. Throughout the evening, attendees shopped environmentally-friendly offerings and learned about each label’s sustainable presence. With its Venture Fellows, BF+DA supports local designers, while providing consumers an open door to more eco-conscious products.